I’ve been reading slowly for the last six weeks because I’ve spent most of my reading time since Labor Day weekend watching Friday Night Lights. I don’t often finish TV series that I see so many raves about. I gave up on The Sopranos and Lost but finished Breaking Bad, but I’ve never really gone through a set of five seasons so quickly. I’m a sucker for teen angst, I loved a whole bunch of the characters, and the football obsession is a little removed from my daily existence. I am so fond of that show. What I have managed to read in the last month is a lot of Canadian crime fiction as well as Exile, the second book in the Garnethill trilogy by Denise Mina. Exile grated on me when the main character Maureen kept getting herself into needlessly dangerous situations, but fortunately as I dipped into a couple early Joanne Kilbourn novels by Gail Bowen, the amateur detective didn’t risk her life needlessly so much. Both Murder at the Mendel and The Wandering Soul Murders were published in the early 1990’s, so I knew I could probably avoid the unreliable narrator thing I keep on coming across in recently published crime novels. What was striking about the books was just how dark they turned in the second half of each novel as Joanne found out that things were not as they seemed. Finally, I also finished Louise Penny’s Bury Your Dead, which wraps up a lot of plot threads from the previous installment in the Inspector Gamache series, The Brutal Telling. It’s the only police procedural I’ve read recently, and it’s the rare book that I loved for its ending. The story involves the murder of an obsessive amateur archaelogist trying to find the remains of Champlain in Quebec, and the backwards-moving storyline involves Gamache involved in an awful police shooting that isn’t completely revealed until the last section of the book. After this stretch of reading books in series I like, I think it’s time to try something new to me. It’s a rainy Sunday afternoon and I have a little time to dig around on my shelves and my Kindle, whose contents I frequently forget. Have a good weekend. 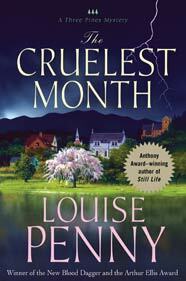 I didn’t love this 5th installment in the Three Pines/ Inspector Gamache series by Louise Penny. It’s a story about a murder where the suspect is one of the village residents and he or she remains so. There is a bit of an open ending (appealing a conviction or sentence), but that’s not a real surprise to me. This book felt longer than the other installments. Certain things started annoying me. 1. Penny uses a lot of sentence fragments. A lot; 2. The artists that populate the slightly mythical village of Three Pines and its environs are almost all genius level artists. And Gamache is a genius level detective, which would be okay if the narrator or various characters didn’t continually remind us of the fact. It’s okay to make Three Pines a less-than-realistic place (it has an awfully high body count, for one thing) populated with regular folks or regular artists; 3. The puzzle element of the mystery felt off to me. I’m not usually into puzzles: it’s just not something I’ve ever read a lot of. Was it an homage to some other book or to some other device that I just missed? Ultimately what it came down to is that this book wasn’t as pacy or twisty as I tend to like the most, and the fact that I’m well into the series made it feel a little stale to me. That’s not to say I totally didn’t enjoy it, but I felt myself prickling about certain things that I usually don’t mind. Source: I bought my copy of the book. I really enjoyed the first three installments in the Gamache/Three Pines series, and since it’s been a significant amount of time since I read the series, I decided to see if my opinion has changed. I haven’t read anything quite this cozy in awhile, and I was a bit resistant to the book because of that. A Rule Against Murder takes place in a remote vacation lodge on a lake. It used to a be a hunting and fishing lodge, but when the current owners took over, they established “a rule against murder,” to atone for the vast quantity of taxidermied animals in the attic. 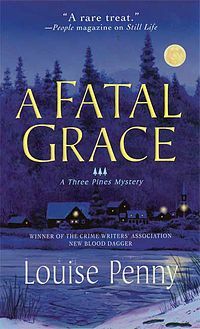 Inspector Gamache and his wife are visiting the lodge to celebrate their wedding anniversary, and the only other guests are an extended family there for a reunion. One member of the family is murdered by the stone in the alternate title, and Gamache’s vacation is cut short to solve the mystery. My favorite part of the book was learning more about Gamache’s backstory (his childhood and his parents), but the actual investigation was not the strongest part of the story for me. There’s a lot of psychological conjecturing and summarizing of character’s personalities that feels a tad heavy-handed to me, and that comes down to my bias in favor of more twists in a plot. I hope the next installment gets back to the village of Three Pines! 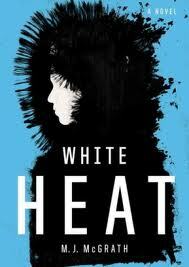 So White Heat may take place in the most far-flung locale of any book I’ve read this year: Ellesmere Island in the Arctic, part of the Nunavut territory of Canada. The main character is Edie Kiglatuk, who is half Inuit, and she is a hunting guide and teacher who investigates the mysterious death of one outsider (a man she led on a hunting expedition) and the apparent suicide of her former stepson Joe. She works by herself for most of the book, in true amateur PI fashion, and part of the time she works with Derek Palliser, a member of the High Arctic Police Service who also happens to be part Inuit. The setting is key: the people, the society, the outsiders who move or visit Ellesmere Island, the land. McGrath spends a lot of time describing Edie’s travels during the investigation and what measures she takes to survive the cold, and those passages make the setting more accessible to someone like me who’s never been to the Arctic. I only have minor quibbles with the book, and those are that Edie’s dialogue toward the end feels a bit preachy and that the pacing feels a bit slow in spots. I’m picky about PI novels because I’ve overdosed on them over the last twenty years. I go into a PI novel a bit skeptical that the protagonist can reach the conclusion on her own. That being said, I did enjoy this book a great deal. Other reviews appear in Books to the Ceiling (includes lots of background information on McGrath’s nonfiction work about the Inuit), Petrona, and Raven Crime Reads. Finally, a word on how I chose the novel. It was a pick of the Crime Fiction Book Club organized by Rebecca Bradley that meets via Google Hangout monthly. I encourage you to check it out— and I hope to make the November meeting. Just to get a break from all the Scandinavian stuff I’ve been reading lately, I picked up the first Joanne Kilbourn book, Deadly Appearances based on positive reviews of the series I’ve seen in a few places. I’m always game to try series that are new to me.. 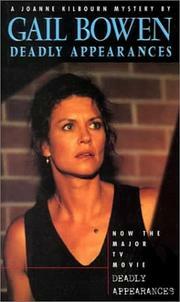 The movie tie-in edition’s cover is not the typical crime fiction cover. The book has an interesting set-up and an interesting protagonist. Provincial opposition party leader Andy Boychuk is poisoned at a constituent picnic in front of 5,000 people in Saskatchewan. Leading the informal investigation is his head speechwriter, Joanne Kilbourn, who’s murdered husband was a a political colleague of Andy’s. Joanne is currently a speechwriter on leave from her position teaching English at university (Bowen is also an English professor). There are a few literary touches throughout, notably a copy of William Blake’s “The Sick Rose,” found in place of Andy’s speech at the podium where he died. The investigation leads Joanne into Andy’s messy private life, which she didn’t know that well at all while she worked for him. Andy and his reluctant political wife Eve live in the country near their disabled teenage son (he was injured in a car crash) and also near Wolf Lake Bible College, which is led by the very charming Soren Eames. Andy is also close to his very Ukranian mother, Roma, who also plays an important role in the book. More interesting than the hidden details of Andy’s private life for me were the varying portraits of political wives in this book. Andy’s wife Eve basically retreated from the political fray, aspiring party leader Craig Davidson has a wife, Julie, who’s bent on getting her husband into Andy’s old position as party leader, and, finally, Joanne herself dealt with the negotiations of rearranging her life around her husband’s political ambitions. There are no easy answers, and none of the women seem entirely happy with their decision to support their political husbands. The actual resolution of the central murder investigation was not the highlight of the book for me. There’s a pretty lengthy stretch of the book that feels too woman-in-peril to me, and, furthermore, it wasn’t too difficult for me to figure out who the murderer was. Nothwithstanding my quibble with the resolution of the book, I’m interested in reading more books in the series. I assume that Bowen’s plotting abilities catch up with her character-writing abilities. This is, after all, just the first book in the series of twelve. Other reviews appear in Petrona, Mysteries and More in Saskatchewan, Confessions of a Mystery Novelist. This is the second novel in the Chief Inspector Armand Gamache series, but it also works as a stand-alone novel. Yes, there are a few things from the first novel, Still Life, that are referenced in this book, but it’s not a huge barrier to entry. I don’t read many cozy mysteries, so it’s a bit hard for me to give up the rollicking plots of mysteries with a thriller edge. The plot is not the main reason to enjoy this book: the main draws are the characters and the writing. This series takes place in Three Pines, a small village near Montreal, a village populated with interesting but not too eccentric people. It’s very reminiscent of Cicely, Alaska from the TV show Northern Exposure: an isolated, village in northern climes with interesting folks. Three Pines is full of interesting, artistic folks. The mystery itself was not a huge draw for me because the murder victim was not a sympathetic sort, unlike the murder victim in Still Life. For a dash of intrigue, the sub-plot involving Gamache’s relationship with the police department was a lot more interesting than the unraveling of CC’s murder. I’d recommend this book for people looking for a story with lived-in, psychologically-well-drawn characters. It’s not a thrill-ride, but it’s a pleasant story about an unpleasant murder solved by a supremely charming detective. Refreshing is the word that comes to mind: it’s refreshing that Gamache is in a stable and happy marriage, and the story is a refreshing take on dour subject matter.